In the first half of the year, South African companies announced plans to invest $5.5 billion (R38bn) in 28 acquisitions offshore, according to Thomson Reuters, an information provider that monitors corporate activity worldwide. And local companies were targeted in 55 deals worth $4.1bn. Last year, 86 outward bound deals were valued at just more than $4.7bn while 108 inward transactions were worth about $8.7bn. Thomson Reuters’ figures are based on all announced deals in a period, both pending and completed. Steinhoff International’s $1.7bn purchase of French furniture retailer Conforama, from French luxury goods group PPR, was the biggest deal between January and June. PPR, the parent company of Gucci, reportedly sold off the non-core business to focus on its luxury operations. In March, Steinhoff shareholders approved the deal, allowing the company, which is the largest furniture manufacturer in Africa, to buy nearly 100 percent of Conforama. Bloomberg said the deal would add 241 stores to Steinhoff’s 951 retail outlets in Europe. And the news agency reported that Steinhoff operated 50 factories in countries including Poland, the Netherlands, Australia and South Africa. The next biggest deal in the first half was the $1.3bn acquisition, by the Public Investment Corporation and Growthpoint, of the V&A Waterfront from Dubai World and London & Regional Properties. The sellers had acquired the property in a private equity deal from Transnet in 2006 for $1bn. The deal took place through a special purpose vehicle, Lexshell 44 General Trading. The following year Dubai World was reported to be investing another $1bn in V&A. Dubai World was set up in 2006 to diversify the emirate of Dubai’s economy out of oil but the company’s ambitious investment plans were hit by the global recession. In November 2009, the Guardian in the UK reported that the state-owned company would seek a six-month moratorium on repayments on its $60bn in debt. Dubai World then embarked on a divestment programme. In April Brazil’s Vale, the world’s largest iron ore producer according to Reuters, announced plans to buy South African mining company Metorex for access to its copper and cobalt operations in the Democratic Republic of Congo and Zambia. Thomson Reuters, which values the deal at $1.2bn, described it as pending. Sasol said earlier this month that it had completed the acquisition of Canada’s oil and gas exploration group Talisman’s Cypress A acreage. Thompson Reuters said the completed deal was worth $1.1bn. South Africa’s Taung Gold is the target of a $985.8 million takeover by Chinese construction firm Wing Hing. The ANC bowed to pressure on the Protection of Information Bill on Friday and promised major concessions to bring the legislation in line with the Constitution. The ruling party agreed to drastically narrow the scope of the bill and to scrap minimum sentences for publishing classified information, which had been seen as a threat to the media and whistle-blowers. MP Luwellyn Landers, who has led the ruling party's arguments in the committee drafting the bill, said the rethink came as a result of serious concern expressed by senior ANC members and civil society. Excellent interactive map from the Wall Street Journal is available here. KHAYELITSHA TOWNSHIP, South Africa—Mavis Nonkongozelo walks up to the Five Sisters convenience store here, then pulls a mobile phone from her bag and a few rands from her brassiere. She is ready to bank. With a few taps on her cellphone, the 34-year old preschool teacher connects to a nascent mobile-banking network aimed at Africa's new consumers. The saleswoman accepts a 20 rand ($2.94) bill through a barred window and then taps back on her cellphone. Soon, the money is credited to a special no-fee account at Standard Bank, South Africa's largest. 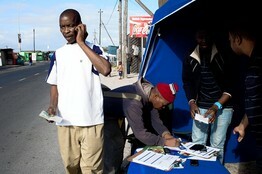 Standard Bank employees sign up residents for cellphone banking accounts in Khayelitsha, the largest township in Cape Town, South Africa. From this corrugated-metal shack outside Cape Town, Standard is breaking from its main business of drawing customers to its branches and automatic teller machines in favor of a low-cost mobile-phone model that is based on proximity to people, like Ms. Nonkongozelo, who have never banked before. The shift says a lot about where banks are placing bets on Africa's economic growth as a new middle class emerges. Since an official launch last year, Standard has opened more than 8,300 of these so-called "bank shops" at sites ranging from street-side convenience stores to raucous taverns. By the end of this year, Standard intends to have 10,000 set up around the country, mostly in South Africa's predominantly black townships, and has recruited local sales agents to find customers. The shops aim to tap what executives estimate is a pool of about 15 million people in South Africa, or about 30% of its population, who don't have active bank accounts but now have the means to spend and save. Standard doesn't charge for this type of account, but the bank earns small commissions on cash transfers and those who stock up on mobile-phone credit. "It's not a golden pot of money," says Thoraya Pandy, one of the managers at Standard spearheading the mobile-banking program. "We need to bring in loads and loads of customers." The dearth of banks in Africa has long constrained the flow of capital and economic growth. Most banks deemed the costs of expanding branch networks too high and the return from poorer customers too low. Only 20% of African families have bank accounts, according to the African Development Bank. And there are Nearly nine times as many people in developed countries borrowing money as in Africa, according to the World Bank. Even in South Africa, the continent's richest economy and the one with the heaviest concentration of banks, rural residents rely on taxi drivers to transfer cash between towns. The drivers typically take 10% of the total. But Africa's banking picture is changing, thanks to rising incomes and spreading use of mobile phones. In a new report, the African Development Bank estimated that a consumer class—defined as those who have $2 to $10 a day to spend—has grown to about 300 million, a critical mass the size of similar middle classes in China and India. At the same time, mobile-phone subscriptions in Africa have jumped from 90 million in 2005 to an estimated 333 million in 2010, according to the United Nations. 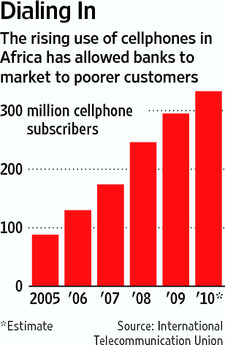 In South Africa alone, cellphone-banking subscriptions—offered by all of the country's big four banks—grew 21% between July 2009 and June 2010, according to the most recent figures from the nation's central bank. As a result, financial firms are deploying mobile-phone services to reach once-unreachable customers. South Africa's First National Bank is using mobile banking to expand into neighboring African countries. Standard is rolling out its mobile-bank-shop model in Nigeria, the continent's most populous country and one of the fastest-growing economies. Meanwhile, Western Union Co. has teamed up with M-Pesa, a unit of Kenyan telecommunications firm Safaricom, to conduct money transfers with other parts of the world via text messages. M-Pesa now has 14 million customers, partly because it caters to people banks have neglected, according to Khalid Fellahi, a senior vice president at Western Union. "Africa is the hot spot for these kinds of services," he says. Still, managing and expanding a business that relies on high volume and thin profits isn't easy. A study released last month from the Monitor Group, a global consulting firm, identified 439 initiatives selling to African consumers living on less than $2 a day, but it said most of them were struggling to turn a profit. The study's lead author, Michael Kubzansky, said financial firms that found ways to reach poorer customers through retail outlets—and even churches, in the case of one insurance company— improved their odds for success. But even banks that have aggressively courted Africa's lower-income consumers say mobile phones and retail outlets can't substitute, at least in the short term, for a bank counter. "When a client has a problem, they want to talk to someone," says Carl Fischer, head of marketing and corporate affairs of Capitec Bank Ltd., a South African firm that offers low-cost banking. "Changing that behavior is very tricky." For Standard, the bank-shop rollout hasn't come without glitches. Some stores have closed abruptly after the proprietors found steady work or returned to their home villages. But the experiment makes sense from a cost perspective, says Coenraad Jonker, one of the Standard bank executives behind the bank-shop program. ATMs have been targets for armed gangs. So instead of automatic-weapon-wielding guards transferring money, a palm-size machine at a bank shop can do the same with a cellphone signal. "It used to be our central concern was security. Now it is accessibility," he says. Standard conducts background checks of potential merchants before it sets them up as cash-transfer points. It screens for criminal records, looks into credit history and makes sure the area where they operate has cellphone coverage as well as electricity. Those selected are then taught how to use the mobile-banking system. Standard doesn't pay merchants, but many see the benefit of being associated with one of South Africa's most-recognized brands. Five Sisters even painted its store the same color as the blue Standard Bank banner that hangs down the side of its shack. On a recent Friday afternoon, a butcher who had been cleaving meat from goat carcasses next-door came to the window to make a deposit. She took a mobile phone and money from a smudged apron pocket and completed the transaction in minutes. Next up: Ms. Nonkongozelo. She was never able to save money before. Now, the preschool teacher and single mother of three has 240 rand in her account. It helps, she adds, that walking to the nearby Five Sisters feels safer than a longer trudge to an ATM, where, in her high-crime neighborhood, she runs the risk of being mugged. "Somebody may think I'm coming here to buy an egg," she says. "They don't know I'm here to withdraw money." The National Planning Commission is a new initiative of government. Chaired by the Minister in The Presidency for National Planning, the NPC is responsible for developing a long term vision and strategic plan for South Africa. The process of developing this strategic plan will include discussion and engagement across our country and also provide opportunities for people to come forward with ideas and suggestions. The plan will be considered by Cabinet. The Commission will also advise on cross-cutting issues that impact on South Africa’s long term development. Lead the development (and periodic review) of a draft Vision 2030 (“South Africa Vision 2030”) and long –term national strategic plan for approval by Cabinet (first plan 2010) · Lead investigations into critical long term trends under the supervision of the Minister in the Presidency for the National Planning Commission, with technical support from a Secretariat and in partnership with relevant other parties · Advise on key issues such as food security, water security, energy choices, economic development, poverty and inequality, structure of the economy, human resource development, social cohesion, health, defense capabilities and scientific progress. Read the Diagnostic Overview here. Davies pointed out an anomaly: despite its growth rate Africa is falling behind in terms of competitiveness. South Africa, which performs best, ranks only 54 out of 139 countries on the World Economic Forum’s competitiveness index. Davies warned that the region’s growth could stall and even decline without greater competitiveness. During a series of trips to Africa last year, Tim Solso had a realization: China was beating him at his own game. So the chief executive of Cummins Inc., a maker of truck and machinery engines, vowed to catch up. He plans to quadruple the company's sales in Africa to about $1 billion within five years, investing $15 million annually to train staff and build sales offices from Johannesburg to Casablanca. The company recently installed in South Africa an executive to oversee Africa operations, previously supervised from Europe and Indiana. James Hagerty discusses the push by U.S. companies, including General Electric and Caterpillar, vying for a stronger foothold in Africa. 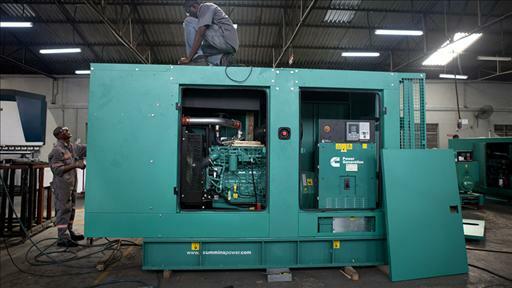 Cummins has ramped up sales of generators to clients such as this bottler in Nigeria. Cummins joins a growing number of U.S. companies vying for a stronger foothold on the continent. Caterpillar Inc., the giant maker of construction equipment, is selling more trucks to Mozambique and Zambia. Harley-Davidson Inc. is opening dealerships in Botswana and Mauritius. General Electric Co. has its first aircraft-leasing office in Ghana for Central and West African airlines. Google Inc., Archer Daniels Midland Co. and Wal-Mart Stores Inc. are among the dozens of other U.S. companies moving in or expanding. Until now, "Africa has been just a rounding error for us," says Brady Southwick, Cummins's new head of Africa operations. U.S. companies' game of catch-up shows the perils of waking up late to the next big frontier market, Africa. The continent's economy is forecast to grow to $2.6 trillion in 2020 from $1.6 trillion in 2008, fueled by booms in mining, agriculture and development of ports, roads and other infrastructure, according to McKinsey Global Institute. The middle class is growing, and total household spending now exceeds that of India. Getting in early to a developing market allows companies to build up strong brands and sales channels that can reap big profits in the long run. That's what China has done in Africa over the past two decades. It has aggressively promoted trade and investment, courting countries by offering aid in exchange for favorable trade terms. China's government has provided funds to build a telecommunications network in Ethiopia, the Merowe Dam in Sudan and railways in Libya and Nigeria, among many other projects. While most U.S. companies focused international expansions on Asia and Latin America, China was leapfrogging America in Africa. China's exports to Africa last year totaled about $54 billion, up from $5.6 billion a decade before, according to the IMF. U.S. exports to Africa totaled $21 billion last year, up from $7.6 billion in 2000. Chinese consumer-electronic products, processed food and pharmaceuticals are popular in Africa, while auto and truck makers from China are starting to build up market share. The country is a major builder of airports, roads and other infrastructure, and China's Huawei Technologies Co. is a leader in installing cell-phone transmission networks. Western European companies, many of which had lingering business interests in Africa from colonial days, also took their eye off the ball. 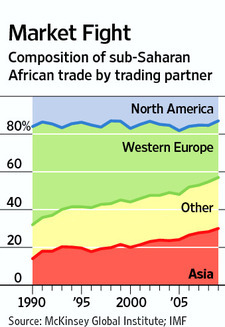 Western Europe's share of overall trade—the sum of imports and exports—with sub-Saharan Africa dropped to 30% in 2009 from 52% in 1990, according to McKinsey. The share of China and other Asian countries in Africa trade more than doubled to 30% from 14% in the same period, while North America's share slipped to 13% from 16%. Many of Africa's one-party national governments find it easier to deal with the Chinese government. The U.S., under the African Growth and Opportunity Act of 2000, grants preferential trade terms only to African countries deemed by the president to be "reforming" in such areas as supporting market-based economies, the rule of law and protection of human rights. China makes no such demands. In a policy paper published last September, China's State Council, or cabinet, extolled the mutual benefits of doing business in Africa, including "promoting economic development and social progress." Some U.S. business people say they could use more assistance from American embassies in Africa, which can help companies gather information and find their way through local bureaucratic mazes. But the number of commercial staff members at U.S. embassies and other offices in sub-Saharan Africa has dropped to 38 from 61 a decade ago because of budget constraints, the U.S. Commerce Department says. Even so, U.S. companies increasingly see opportunities in Africa. Caterpillar recently got an order from Mozambique for 10 of its biggest mining trucks, behemoths that can carry 400 tons of ore and typically cost more than $6 million each. The Peoria, Ill.-based company says it sees opportunities for sales growth from copper mining in Zambia, iron ore in Congo and gold in South Africa, among others. 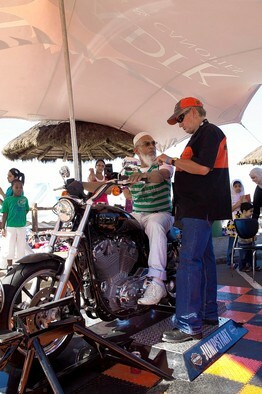 Harley-Davidson hosted Africa Bike Week in South Africa. Harley-Davidson also is trying to expand its small share of the market in Africa, where it competes with Bajaj motorcycles from India and Chinese brands Jincheng and Lifan. Harley has dealers in Morocco, Egypt and South Africa and expects to open more in Botswana, Mauritius, Namibia and Angola. The company says more than 20,000 motorcyclists converged on the South African resort town of Margate in late April for the company's annual Africa Bike Week festival, promoting the Harley "lifestyle" and featuring a local bagpipe band, a Pretoria rock band called Black Era and snacks such as grilled springbok. DSC Dredge LLC, a maker of dredging equipment in Reserve, La., used to sell dredges in Africa only when customers made unsolicited inquiries. "By dumb luck, people find you on the Internet," says Bob Wetta, president of the family-owned company. Now, DSC executives make several trips there each year and are considering opening an office in Lagos. 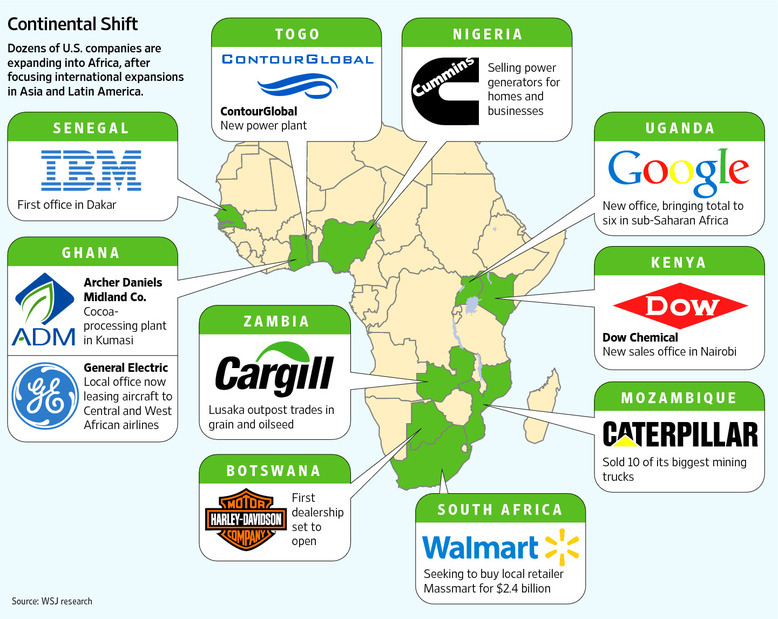 A few American companies have been entrenched in Africa for decades. Coca-Cola Co. established its first African bottling plant in 1928, in Johannesburg, and its soft drinks now are available throughout the continent. 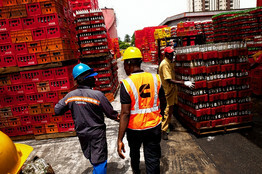 But many other U.S. companies only now are "starting to wake up to the African opportunity," says Acha Leke, a Lagos-based director of the McKinsey Global Institute. To succeed, he says, they will need to find good local partners and send in some of their best executives. In the past, he says, some American companies "just sent whoever wanted to go there." Mr. Southwick, who had spent eight years working for Cummins in China and Singapore, wasn't seeking a job in Africa when CEO Mr. Solso persuaded him to go there last September. The last time the 40-year-old had set foot in Africa was as a college student, when he spent three weeks touring Egypt. Cummins workers assemble a generator in Lagos, Nigeria. Coming from Asia, Mr. Southwick says, he thought he was used to chaotic, fast-changing societies. But he's found Africa far more complicated. For starters, "you're dealing with 54 countries," each with different rules, and many with unstable governments, he says. During a recent trip to Angola, he couldn't get Internet access for a day and a half. Flying from Johannesburg to North Africa often requires changing planes in Europe. Getting a visa to go into an African country can take up to three weeks. Cummins has a long history in Africa. In 1946, a Cummins sales distributor set up shop in the same building in Morocco that Gen. George Patton used during World War II as a base to march his forces across North Africa. But for decades, Africa wasn't a priority. In 2010, Africa accounted for about $264 million of sales for Cummins, compared with about $1.3 billion in China and $13.2 billion world-wide. Cummins hopes it can now become a leader in power generators in African countries whose electricity supplies are notoriously unreliable. Nigeria, where Cummins has a 50-50 joint venture with a local company, AG Leventis PLC, is among the most attractive African markets. Cummins estimates that only 40% of Nigeria's 150 million people have access to electric power. Power outages are so common that schoolchildren sing a song when the utility company "brings light." Many businesses and wealthy homeowners buy diesel-powered generators either as primary or backup sources of power. Generators also power cell-phone towers, street lights and various types of equipment. 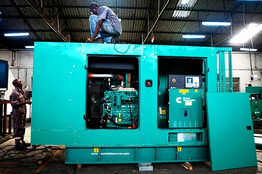 Some 30,000 generators were sold by various companies in Nigeria in 2010, according to Cummins estimates, bringing total industry sales in the country to about $420 million. Of that, the Cummins joint venture has just an 8% market share, according to the company. Expanding that share means overcoming the challenges to doing business here. In Lagos, one of sub-Saharan Africa's biggest cities, grinding traffic means service vehicles take longer to arrive at customers' doorsteps, and employees have grueling commutes. "Just to get to work is a big challenge," says Koulis Schizas, general manager for Cummins power projects in Nigeria. "The average employee has a two-three hour drive to get here in the morning and a four-five hour drive to get home. It does affect the business." Worries about fraud slow the sales department, and new employees have a steep learning curve. Cummins is working with universities in Nigeria and Ghana to strengthen their engineering departments. "Right now we have hawkers, not salesmen," says Usama Yousaf, Cummins Nigeria's head of sales and marketing. Ghana, despite being smaller and easier to do business in than Nigeria, has presented its own difficulties. It took four months to get a business license in Ghana. Cummins still doesn't have a license to trade in U.S. currency, which many customers prefer, even though it applied for one on the first day of operations two years ago. Regional logistics are a constant headache. An order for two generators from a customer in neighboring Ivory Coast, for example, was complicated by a recent political crisis in that country, where fighting erupted after last November's elections. Because the roads were impassable, Cummins was forced to air freight the generators at a cost of $30,000. There's also the basic issue of pricing. Cummins's high-end generators are too expensive for many customers, and CEO Mr. Solso says the company will have to start making more affordable models to crack the mainstream market. Many Chinese companies make small gasoline-powered generators costing as little as $500 and sold in open-air markets alongside cooking pots, ironing boards and spices. Cummins's least-expensive models available in Africa cost about $9,000 and are diesel-powered. Aside from price, "a big issue is brand awareness," says Usama Yousaf, head of sales and marketing in Nigeria. Only 12% of potential Nigerian buyers are aware of Cummins, a recent company survey found. Cummins recently demonstrated its residential generators at a popular Lagos shopping mall called The Palms and plans to set up a retail outlet in the city's bustling Oregun market. It's a start, says Mr. Solso, who says Africa in some ways reminds him of where India and China were 10 or 15 years ago: "We have a long way to go." —Peter Wonacott and Jacqueline Bischof contributed to this article.